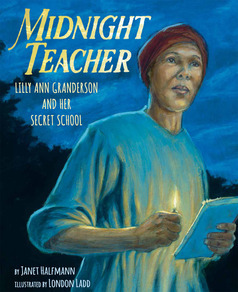 Midnight Teacher Lilly Ann Granderson and Her Secret School by Janet Halfmann, illustrated by London Ladd. Lee & Low Books Inc., New York, NY 2018. “From a young age, Lilly Ann Eliza Cox believed the path to freedom was through education.” She was a slave in Kentucky where she lived in the master’s house. “When the adults weren’t watching, the master’s children often played school with her.” And so, using an old speller the children found for her, Lilly Ann learned to read. Although it was not illegal for slaves to learn to read and write in Kentucky, it was frowned upon. Slaves might get ideas about freedom and running away, if they had the ability to read. She was proud when she learned to write and to read the Bible on her own. As she grew older, she shared her knowledge with other slaves. On Sundays, while the master’s family attended church, she and others would find a secret place to practice their words using sticks to form letters in the dusty soil. Lilly went through hard times when her master died, and was bought by a plantation owner in Mississippi. She was put to work in the cotton fields. Reading and writing by slaves was against the law in Mississippi, but Lilly managed to carry on with her secret school, teaching young and old alike. Eventually, she was found out. After the war, Lilly Ann went on to become a teacher and advocate for education. She helped establish Natchez Seminary, which is now Jackson State University. Midnight Teacher is a suspenseful piece of non-fiction. Yes, you read that correctly. Like Janet Halfmann’s previous book, Seven Miles to Freedom the Robert Smalls Story, Midnight Teacher takes the reader, along with the protagonist, through a perilous journey. Based on a true story of a courageous woman who takes risks so that she can accomplish her goal of educating other slaves, this book is the ideal companion to a Social Studies unit on slavery and the Civil War. Janet’s research spanned about ten years and many interviews with not only scholars, but also with family members of Granderson’s (Lilly’s married name). Her respectful research and writing are a tribute to the care she took with this story and Robert Small’s. When asked how she finds these stories of little-known people, she said if she reads an article and someone like Lilly or Robert is mentioned, she jots the name down and begins her research. This is an inspiring and fascinating read. Teachers are searching for high quality non-fiction, and a suspenseful, fast-paced read is just what is needed to keep kids engaged in both reading and, in this case, social studies. This book belongs on every classroom shelf. Check out The Storied Past blog https://thestoriedpast.org/ to see reviews of many great books, including my review of Seven Miles to Freedom. An uplifting, refreshing read about a brave, relentless woman who risked death to teach others. Thanks steph- sent to my daughter for the twins, looks good! Thanks so much for this wonderful review of Midnight Teacher. I’m so honored to have had the opportunity to tell the little-known story of this heroic African American teacher! I’m hoping her name spreads to become a household word!